This week wasn’t much that much more eventful than last week, however, I am making small steps towards turning this place into a home! So, when you return from your late night grocery run, pull up a chair , heat up some Annie Chun’s noodles and welcome to my life as a Durhamite. 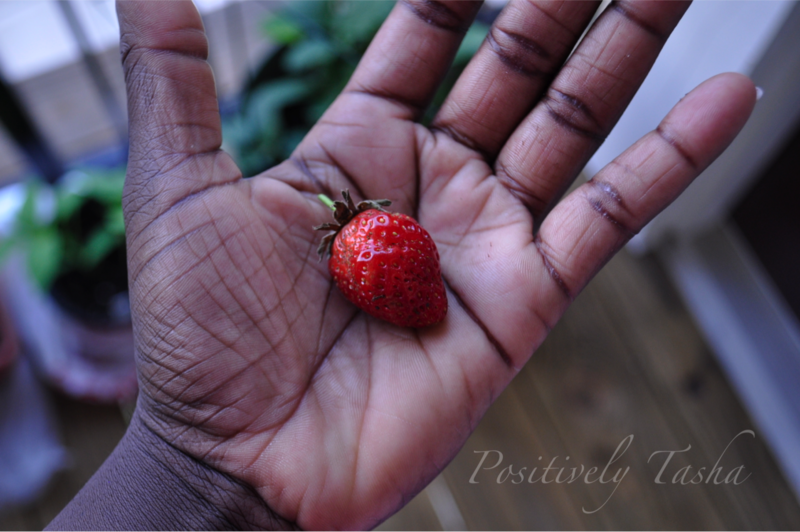 This week I tasted my first home-grown strawberry! 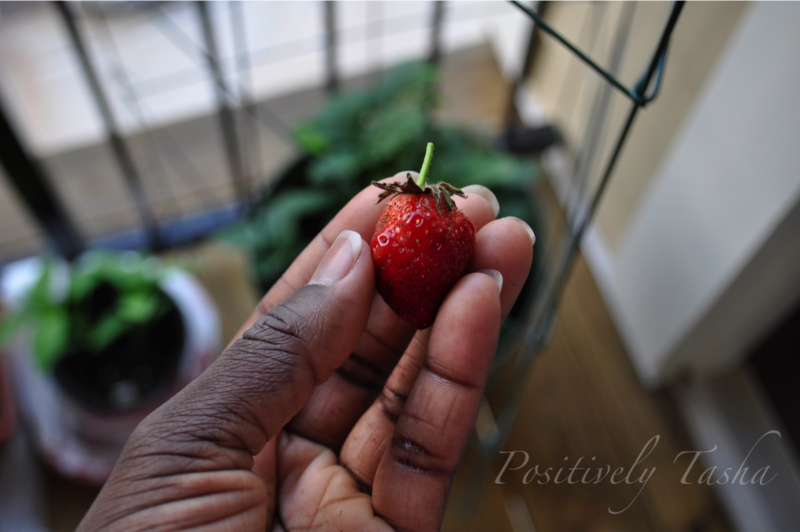 It was a wonderful experience harvesting and utilizing something my plants made. Working on that green thumb!! The fruit wasn’t completely sweet but my baby plant has potential!! I cannot wait until I can begin to harvest tomatoes and jalapeños. 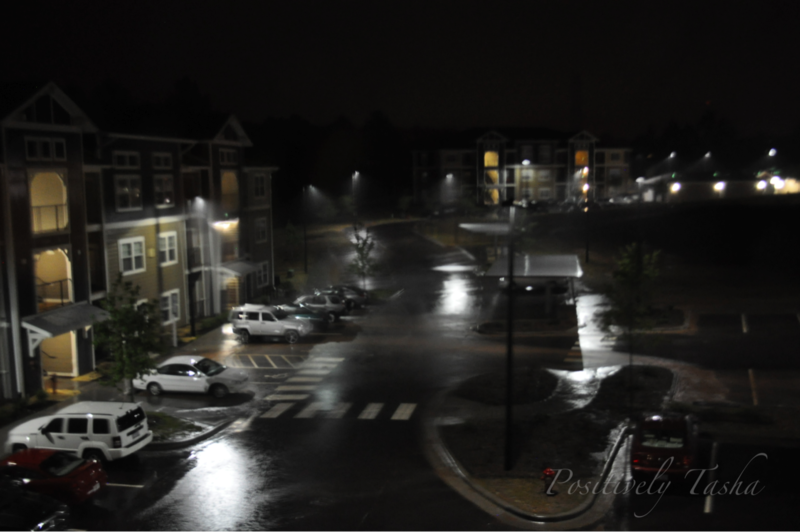 This week, there was a torrential downpour of rain! It was crazy! We had a tornado warning on Thursday night. It was at the same time as our recruitment party for work so I truly had no idea. It was a good thing we moved the party indoors and not in the park or else we could have blown away! … of an oven baked potato. I truly feel that there is nothing like it! I prepared dinner and lunch in the oven. First, I washed to potatoes and wrapped them tightly in silver foil. Then I placed them in the hot oven and let it bake for an hour and a half. The warm smell flooded my apartment and I was elated! 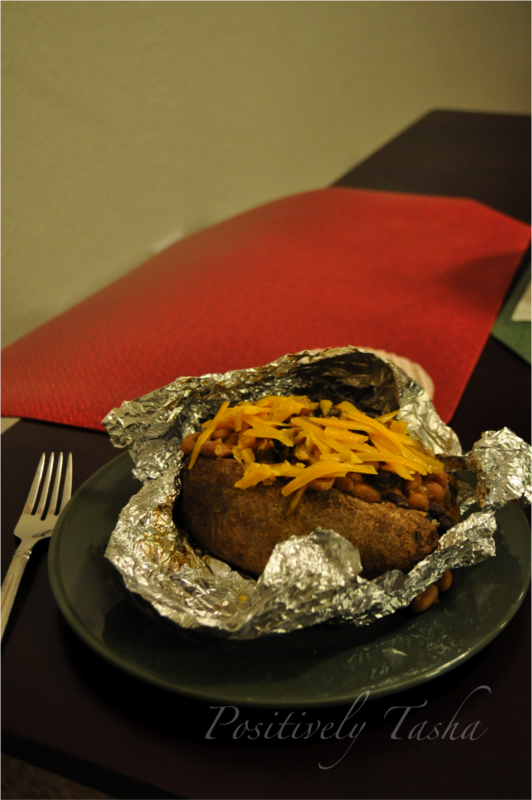 Truly baked potatoes are such a time consuming gift, but they are delicious! 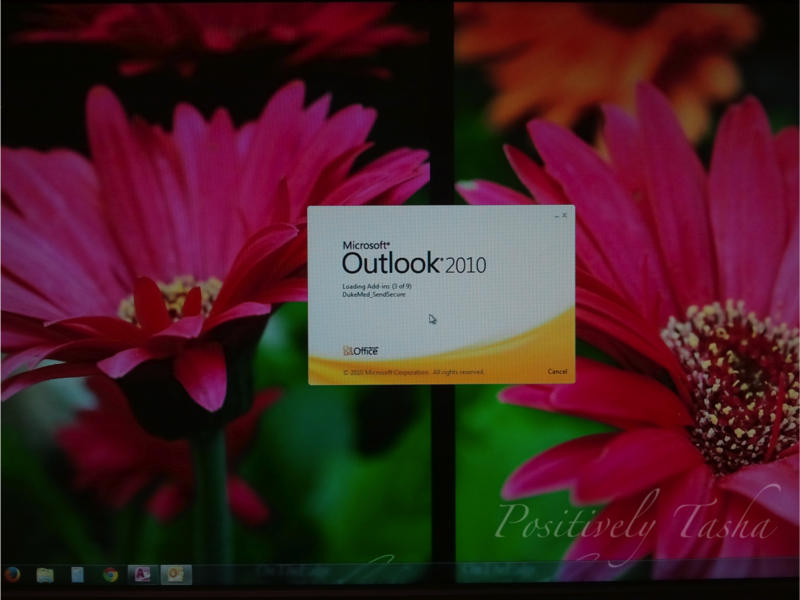 This week at work I decided to change my background from the standard Windows Professional background to my flower diptych! I smile every time I see those beautiful pink and orange flowers reaching out towards me. It help me feel that nature is not too far away when I am locked my windowless office Haha. Congratulations! You are viewing the first photograph of the interior of apartment in Durham! You should feel so very special. Kidding. You are already special. I am creating balance in my apartment! 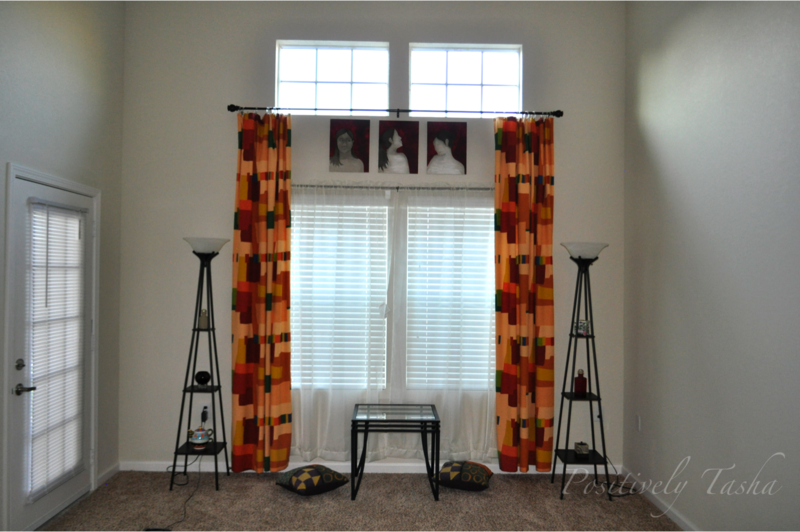 Here we have the beautiful curtains made by my mother, my two Étagère lamps and a side table. 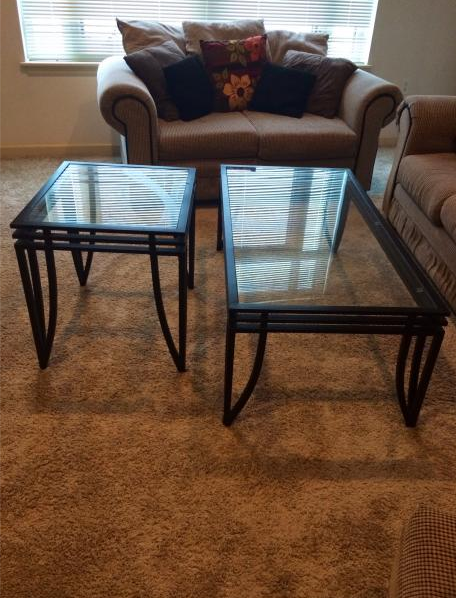 This week, on Friday I purchased 2 coffee tables from Dukelist. They were only $25 and their black metal and glass match my lamps perfectly! Here is the photo I saw from the listing. I contacted the seller on the same day she posted it. I guess it was meant to be! On Saturday morning I heard a loud crash from outside of my apartment window. It sounded like someone carrying sheets of metal dropped them all at once. In an instant I ran to the window to investigate where the sound came from. 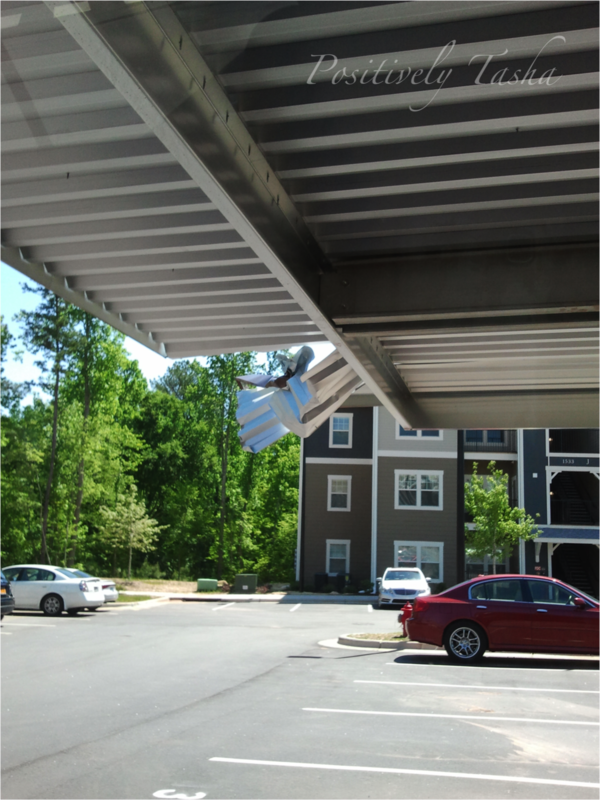 Once at the window I witnessed a man in a Budget truck slowly backing into one of the parking spot near the metal carport, his truck beeped as he moved in reverse. Then in the next moment he was putting the petal to the metal and zoomed out of the apartment complex! carport! 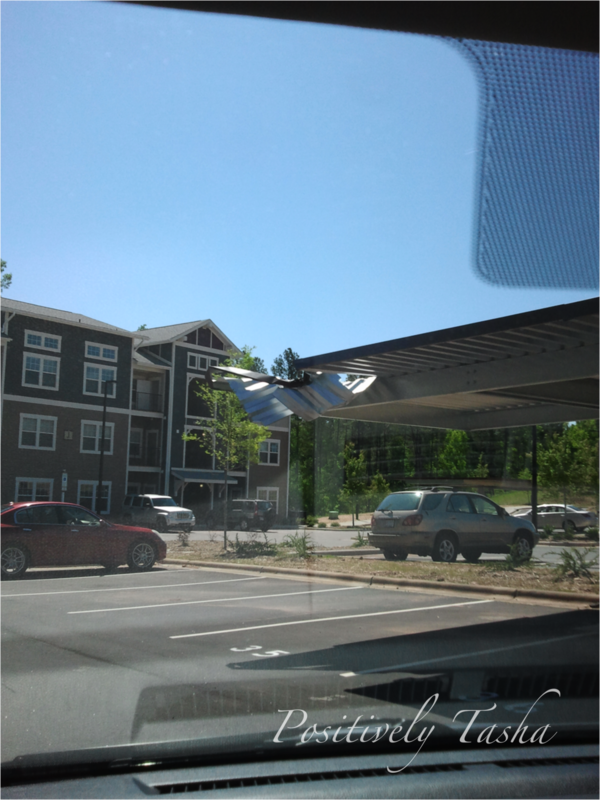 It is pretty crazy how easily the carport was damaged. At least it protects my car from the rain and the hail! That is why I am paying $25/month for this protection. Sadly, none of that will matter if people are trying to tear them down! I was crafty this weekend!! When my mom was still here, we visited the Scrap Exchange and I purchased some pieces of glass and mirror. We also visited a thrift store and I purchased 2 L-shaped shadow boxes. 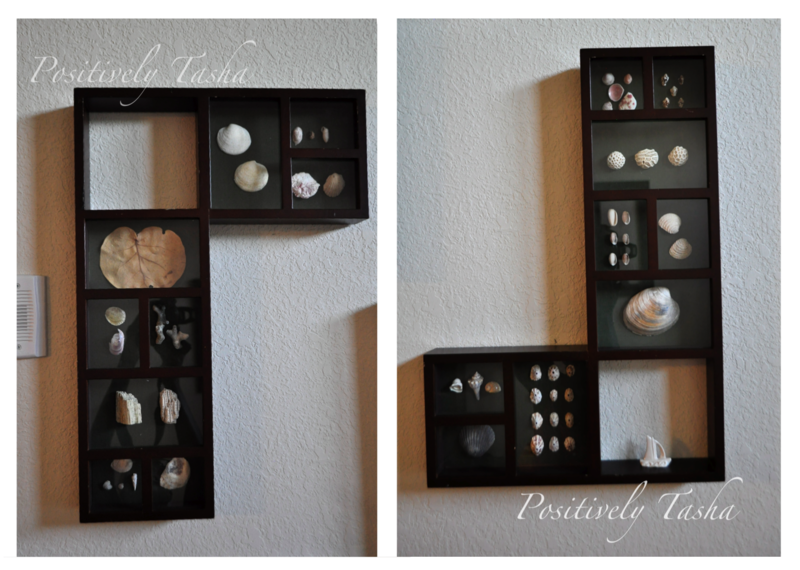 These frames were perfect and I was determined to showcase my marine collections from my research trips to Florida and Puerto Rico in them. However, given that there were no backing boards to the frames, I hung them up empty until inspiration struck me. After our weekly lunch, Jean and I hung out at my apartment and watched MTV’s Catfish: The TV Show. While she was here, I pulled out my purchases from the Scrap Exchange and showed her my intentions with the items. 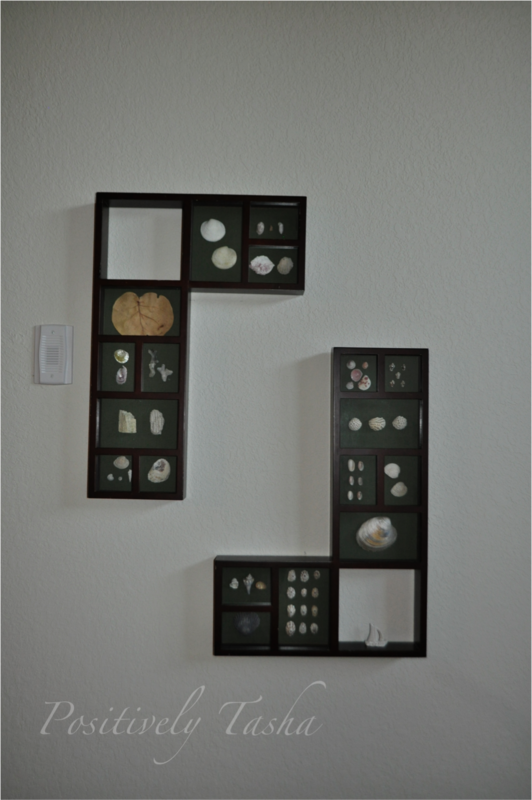 It was then when I decided that on Sunday, I would make my shadow boxes. What do you think about them? It took me approximately 8 hours to make because I was working with a serrated knife, a hammer, and a hot glue gun as my only tools! There is now a battle wound on my left thumb, but I think it’s worth it. You like? My week was capped with a home made dinner late after I finished crafting… and I mean it was late. I probably finished cooking around 10:30 or so? Hahah! 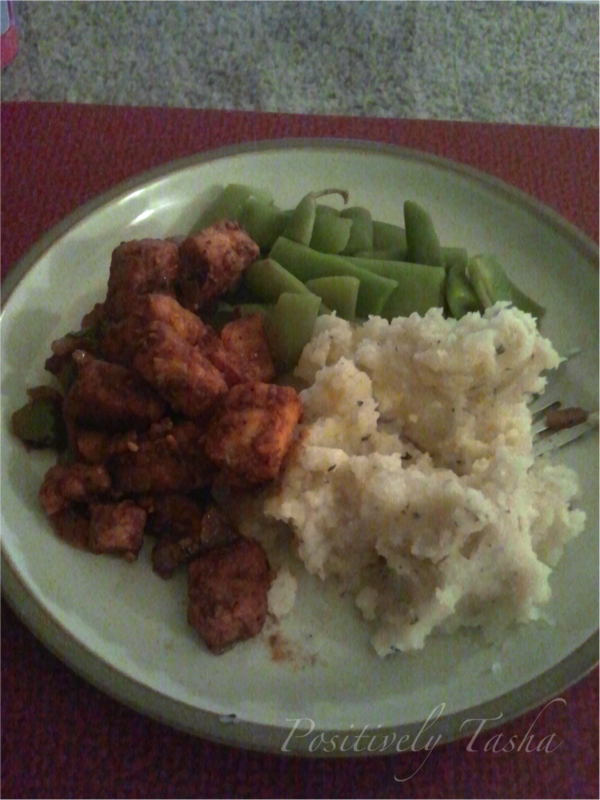 I made an orange balsamic veggie chicken with garlic and basil potatoes and flat Italian green beans. It was absolutely delicious and well worth the struggles of the week. There is no telling what there is in store for me this week, but I know I will try to make the most of it! Thanks for sticking with me, buddy! We are all so very beautiful and we must remember that! Sometimes the world can be ugly, but remember how lovely you are!